A man from Lakewood in Pierce County, Washington, is accused of drunkenly swapping furniture with his neighbours while they were away. The man and his friend pleaded not guilty on Wednesday to residential burglary. The Lakewood couple, who had gone away for the weekend, returned on Monday to their apartment and found a recliner and TV stand that didn’t belong to them, as well as empty beer bottles and pizza boxes. Missing was their love seat, matching chair and ottoman, a cushion for a papasan-style chair, a king-sized mattress from the bedroom and a carpet-cleaning machine. Also missing were pots and pans, dishes, food and military-issued equipment. Tracking the thieves seemed pretty straightforward for police: One left behind a traffic citation stating his name and address; the other left a pizza receipt that had his information. Police spoke with both men, one of whom lived in a neighbouring apartment. The first man said he’d entered his neighbour’s apartment because the door was open. 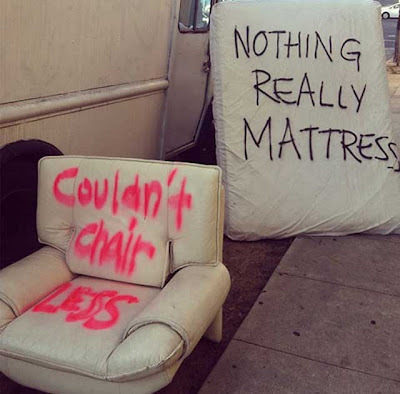 He said the neighbour had mentioned the couple might be moving, so he figured they’d abandoned their furniture. He said he drunkenly decided to switch it with his own, calling his friend for help. He showed officers where the property was, and police found the living room set, four pillows, two floor lamps, two end tables, a TV stand and an inflatable couch with an air pump. There also were three blankets, an iron, a large picture with an ornamental frame, a floor fan, the military equipment, a black stand with four shelves and a plastic container with three drawers and various items inside. Finally was the papasan chair, a rectangular wall mirror, an ironing board and a box of women’s shoes. The first man’s friend, whose name was on the pizza receipt, admitted ordering the food, but denied taking stuff from the apartment. Police found a cover to a crawl space in the apartment was completely off, leading them to believe that’s how the thieves got in.